If you’re a four-year-old kid, chances are you can name about a billion different dinosaurs — it’s one of the first things we learn in preschool or otherwise at that age. Their names, which grown-ups often have trouble recalling — are often derived from Greek. 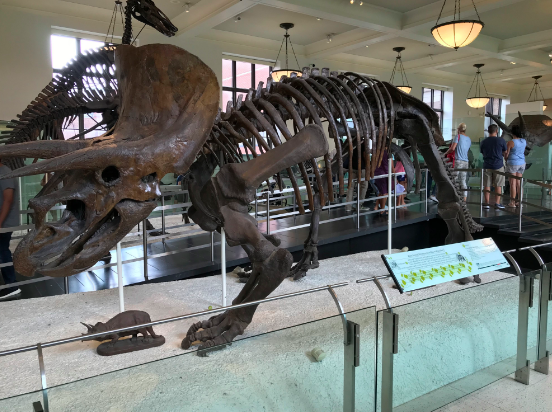 “Triceratops,” for example, the fossil of which is pictured above, means “three-horned face.” “Tyrannosaurus rex” is Greek for “tyrant lizard king.” Even the word “dinosaur” itself comes from Greek; it means “terrible lizard” (but is probably a reference to the beasts’ size than to their temper). Humans gave those names to dinosaurs over the last century or so, not long after the first fossils were discovered and correctly identified. Dinosaurs weren’t named by cavemen because, despite some erroneous belief to the contrary, humans and dinosaurs never coexisted on Earth. But we can imagine what would happen had they lived together. Or, at least, Gary Larson did. Larson, if the name isn’t immediately recognizable, is the genius behind The Far Side, a single-panel cartoon series which ran from January 1, 1980, until his retirement fifteen years later to the day (at age 44!). Many of his cartoons involved cavemen, and the one below, from 1982, is a good example. If you can’t see the image for some reason, it features a caveman giving a lecture to an audience of other cavemen. On the screen is a picture of the tail of a stegosaurus (“roof lizard,” in case you’re curious). Unlike most dinosaurs, stegosaurus tails have a set of spikes — something which would be dangerous to cavemen if the two species had co-existed. 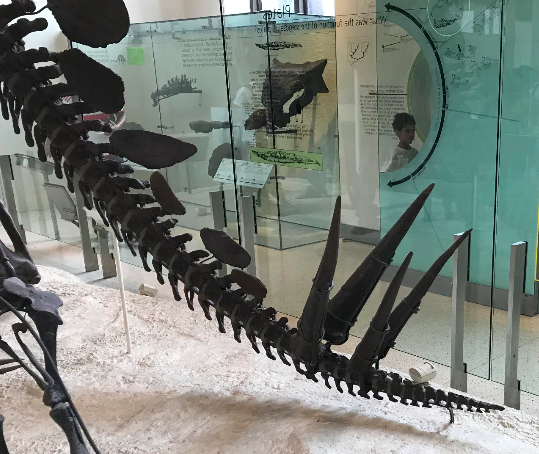 No need to take Larson’s word for it, either — here’s a picture of a stegosaurus fossil below, and if you pay particular attention to the tail (or click here for a close-up of that area), you’ll see the spikes. 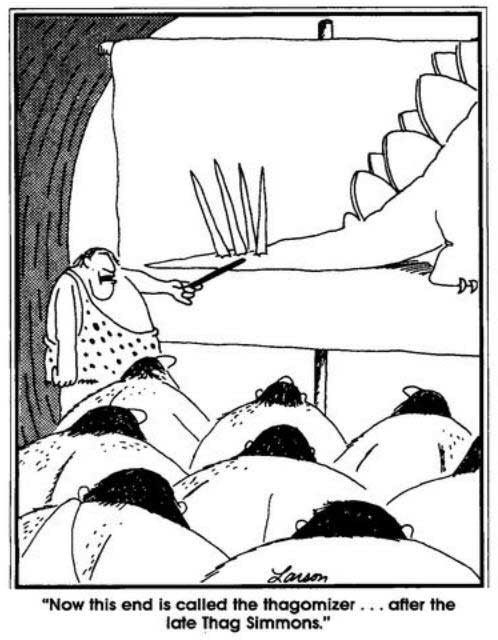 Back to the comic: the lecturing caveman tells those assembled that the spikes, they have a name: “Thagomizer.” And it’s not from ancient Greek, either, in part because the comic is a joke and in part because to a caveman, ancient Greek doesn’t yet exist. As the pictured caveman explains, the thagomizer is named “after the late Thag Simmons,” implicitly another caveman (who probably lost his life to a stegosaurus’ spikes). Again, The Far Side is fiction. But in this case, it was also historical. It turns out that before 1982, no one bothered to give the stegosaurus’ collection of tail spikes a name. And for more than a decade, no one would. But in 1993, at the annual meeting of the Society of Vertebrate Paleontology, a paleontologist named Ken Carpenter decided to change that. In a speech he was giving, Carpenter adopted Larson’s name, referring to the spikes as the “thagomizer” (and likely attributing it to Larson). As Wikipedia notes, Carpenter’s little joke proved popular and the name spread. 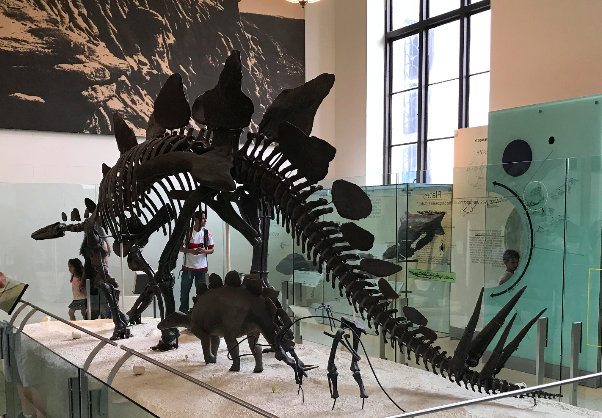 In the 1999 book “The Complete Dinosaur,” the entry for “stegosaurus” notes that “in all stegosaurs, the terminal tail spines (thagomizer) presumably played a role in defense.” In the 2015 BBC documentary “Planet Dinosaur,” the narrator described the stegosaurus as “a heavily armored tank with a deadly weapon at the end of its tail, known as a thagomizer.” And in 2007, the Smithsonian’s website — attributing the etymology of the term to The Far Side — said that “thagomizer” was the “official name” for the collection of tail spikes. Larson’s little joke became a point of paleontology history. Thag Simmons, though, was unavailable for comment. From the Archives: Velociraptors Weren’t Very Scary After All: Jurassic Park lied to us.